You want to look the part on your vacay this summer, right? Well, look no further, because we've broken down each of the key S/S13 trends as seen on the catwalks and matched them with a high street alternative. It's style made simple, just for you! 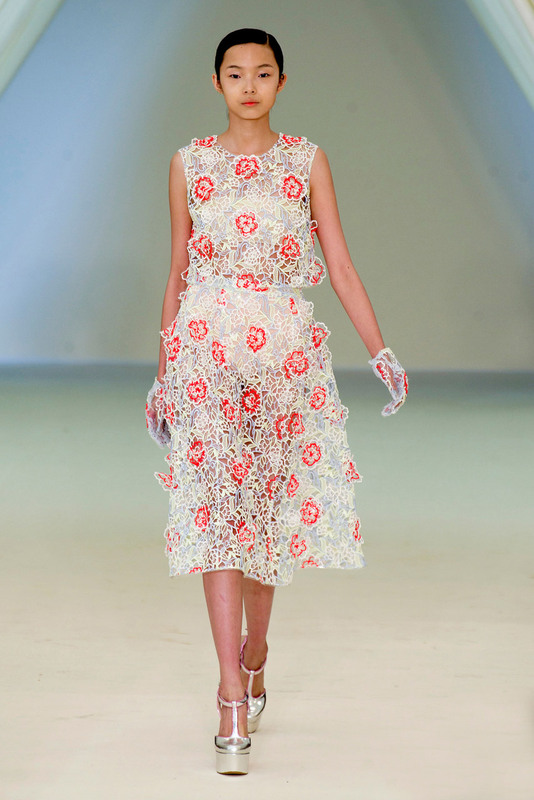 As seen at: Christopher Kane, Giambattista Valli, Akris and Rochas. Kane and Valli both had a mixture of subtle chiffon hems on dresses and the more daring completely sheer pencil skirts and blouses. Rochas opted for a more feminine approach with floor length maxi skirts. How you can wear it: The high street has a great selection of wearable sheer pieces, with Topshop and Zara having some of the best dresses we’ve seen. Topshop has a gorgeous white dress, which will look fabulous with a tan, and by day three you’ll be able to wear it with a pair of simple fine strap sandals in the evening to show off your sun-kissed skin against the pale tone of the dress. If tanning isn’t for you opt for the black version from Zara. Black is very complementary against a fair complexion, but keep the look light and summery with a colourful clutch and sandals. As seen at: Embellished florals were shown on the catwalks at Simone Rocha, Erdem and Oscar de la Renta, while floral prints were taken care of by Marni, Prada and Preen. How you can wear it: Pretty floral dresses aren’t for everyone, so if you feel like tapping into this trend without donning a frock, check out the amazing Zara printed trousers. However, if a pretty floral dress is your cup of tea, try the lovely embellished number ASOS has to offer. Great for a warm evening after a day at the beach. If you fancy something a little more like the Erdem dress (pictured below), ASOS also has an alternative version at a fraction of the price. It’s a dress that demands a lot of attention so keep accessories simple in a neutral colour. 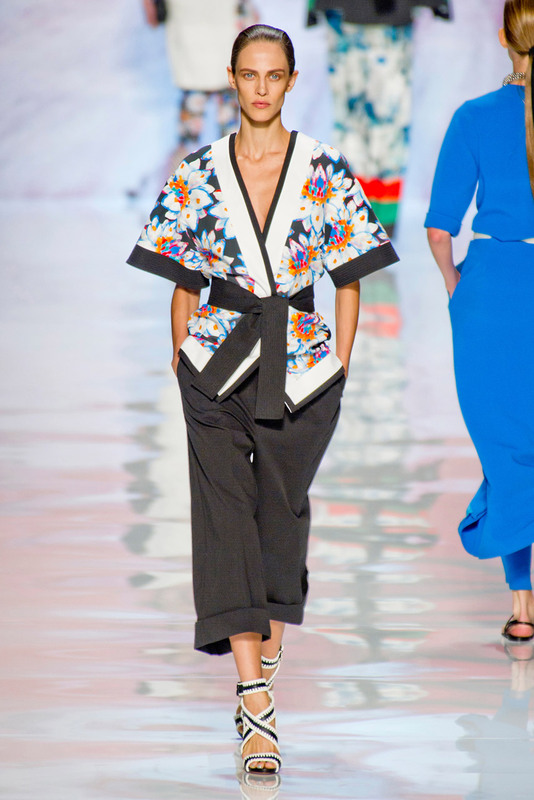 As seen at: This was the biggest trend of the season with obvious nods to Asia seen on many runways. The designers who embraced the trend most were Emilio Pucci, Etro, Prada and Hermes. How you can wear it: You don’t need to be kitted out in a kimono and obi belt to work this trend, but for those of you who aren’t scared to embrace it Miss Selfridge has a stylish kimono that can be worn during the day with a pair of cut-off denim shorts and a simple top, or at the beach as a stylish cover up. If you are after a subtle way to wear the trend, Zara has a great Orient-inspired dress that’s so versatile – you can dress it up or down with a slight change of accessories. For a simple nod to the trend, Topshop’s white flatforms are the way to go. We’re obsessed. As seen at: Givenchy, Balenciaga, Marni and Gucci all flew the flag for ruffles this season. Gucci kept the palette soft in pastel whilst Balenciaga showed a harder ruffle in monochrome. How you can wear it: The ruffle is going to be summer’s biggest shape. It will appear attached to anything from sleeves and hems to collars. We’ve discovered a backless top from Zara which is a great way to wear the look on holiday. Wear with a bikini and printed shorts down to the beach. As seen at: Balmain, Roberto Cavalli, Versace and Stella McCartney – to name a few. This trend will be huge and it is so easy to wear, prepare to see peekaboo cut-outs on everything. How you can wear it: We’ve found a cute Topshop skirt as a great way of wearing the trend without revealing all. Wear with a comfortable pair of flat sandals and a blouse for a relaxed day time look whilst exploring on holiday. For an all over flesh-flashing look opt for this Miss Selfridge maxi dress. It’s perfect for a day trip to a city. Team with a straw fedora and enjoy the sights in style! Will you be trying out any of these key trends this summer? Let us know in the comment box below.